Team Fatty (that is, @eatnik and I) are off and running. Merely hours after @eatnik’s 4:30am arrival – I had arrived the previous day – we headed off for our first stop in what is shaping up to be a food journey of epic proportions. Listed by CNNGo’s guide to Hong Kong as having the best chilli oil in Hong Kong, it was pretty obvious that this place was going to be high on our list of places to visit. 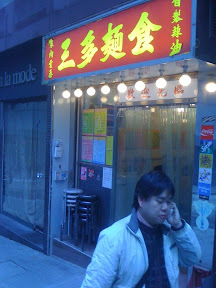 We arrived at around 9:30am, and the place was bustling, but not too busy for us to get a table right away. 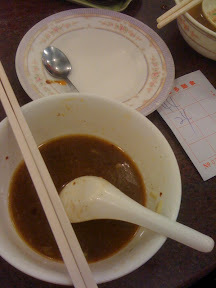 We shared a table with a middle-aged HK lady, who seemed bemused by how excited we were about the chilli oil, tasting it on its own before mixing it in with our noodles. 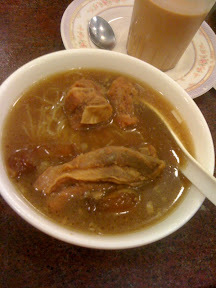 To call this Hong Kong’s best is a pretty big call, and I’m not sure I entirely agree. Sure, it’s very good, but it wasn’t the crazy symphony of chilli flavours which CNNGo had me expecting.It was reminiscent of the crispy prawn chilli which @msbaklover had introduced me to recently. Salty but mildly shrimpy (this sounds weird, but trust me, it’s a good thing) at the same time. 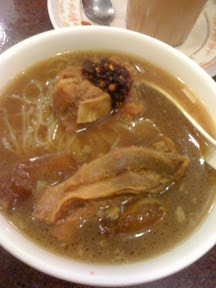 I ordered the beef brisket noodle. I like that (for me) it was the perfect breakfast size. Hearty, and satisfying, but not overly filling. And at $HK28 (around $4AUD) it’s an absolute steal. But that’s a trend you’ll be seeing a lot more of in these Hong Kong #fattyposts. The flavour of the brisket was spot on. A good amount of five spice, but not too much. It was a tad on the oily side, but hey, when you’re on holidays, who cares!? 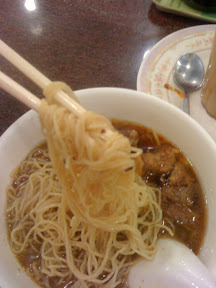 I also love the egg noodles here in Hong Kong. They’re so much finer than the ones we get back in Melbourne, which somehow makes them better. 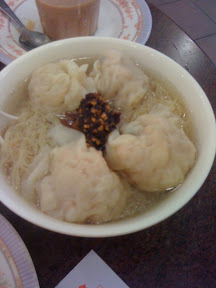 @eatnik had the wonton noodles (also $HK28), which came with four plump little babies sitting atop her bowl of noodles. 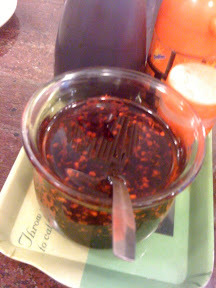 On top of which, of course, she heaped a big spoonful of chilli oil. Having decided early on in the piece that she wasn’t going to try to match my eating prowess bowl for bowl, she was kind enough to give me one of her wontons. They were succulent and tasty, with whole prawns inside. It may or may not be Hong Kong’s best chilli oil – our jury of two is still out on that one – but Sam Tor is definitely worth a visit. 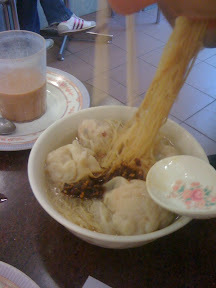 The noodles are awesome, as are their fatboy wontons. Noodles for brekkie.. totally jealous… GO #FATTY! Yay, you are blogging your trip! Thanks for the link-up. 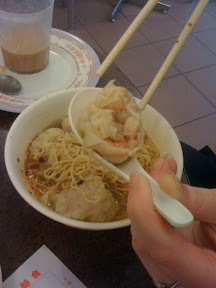 Love the look of those wontons, truly the biggest I have ever seen. Keep having an awesome time! 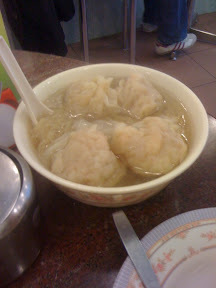 After sampling about four noodle houses in the course of a day, team #fatty has concluded that Sam Tor's wontons are the best in Central, if not the best on the island. More on that in a later post.